This is one in a series of books that teach children about some of the real life differences in many countries around the world. Having worked as a children's’ lead in a bookstore chain I know books like these are hard to find for children. It is perfect for one of those assignments that teachers create for kids and is better than some encyclopedia. There are not a lot of pages as it is a picture book but there are some Indian words that might give some trouble. The author (Carole Roman) thought of that and has a pronunciation guide. 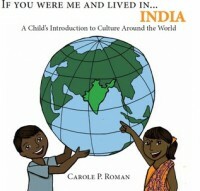 I wish when I was a kid there were books like these focusing on a different country each book. It would have made a many book report easier and maybe would have encouraged me to learn more because it’s simple way it is written.